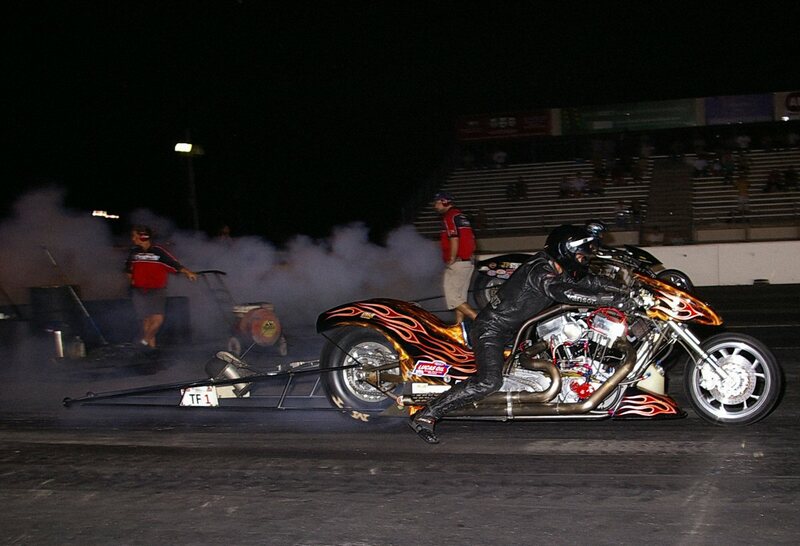 Tak Shigamatsu of Ehime, Japan set the pace for Top Fuel bikes with a 6.298 pass at 225mph as the #1 qualifier. It takes Tak 22 hours of travel from Japan to get to NH. Tom McCarthy Photo. temps hit 102 with track surface temperatures reaching 140 degrees F.
Fourteen Harley Davidson powered drag bikes entered five classes of racing for this HD-DRS race. Six bikes qualified in Top Fuel, two in Pro Dragster, three in Street Pro, two in Pro Gas, and one lone motorcycle entered into the class of Hot Street. In qualifying for the contested classes, Tak Shigamatsu of Ehime, Japan set the pace for Top Fuel bikes with a 6.298 pass at 225mph in the blazing hot conditions on Friday. In Pro Dragster, Dale Niles, Purlear, N.C. recorded a 7.37 @ 171 mph for the number one spot in P/D. Bruce Croneberger III, of Cressona, PA, went 8.860 @ 151.92mph to secure the top spot in Street Pro. 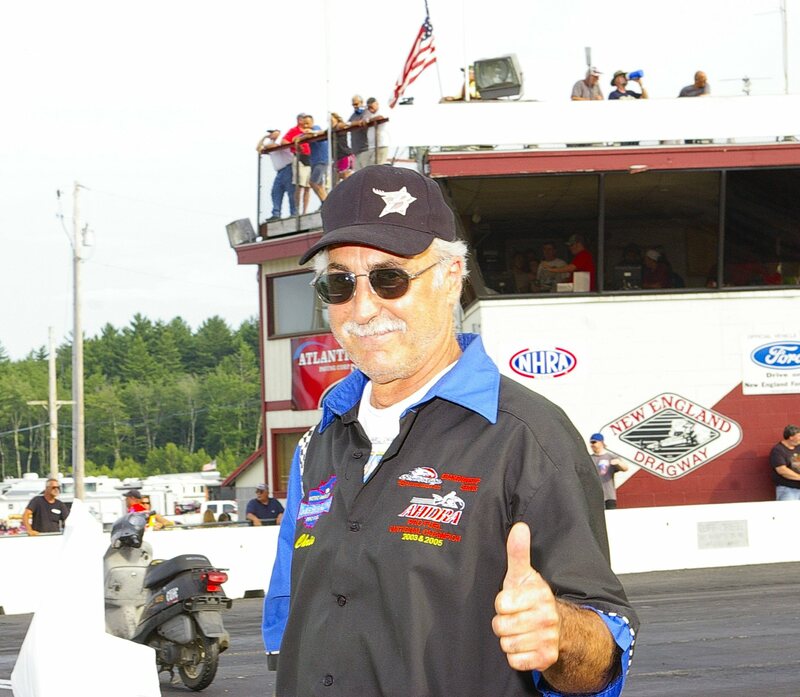 In Pro Gas, Frank Capone, of Wakefield, MA, locked in the top spot with a 8.55 @ 152.64mph effort. 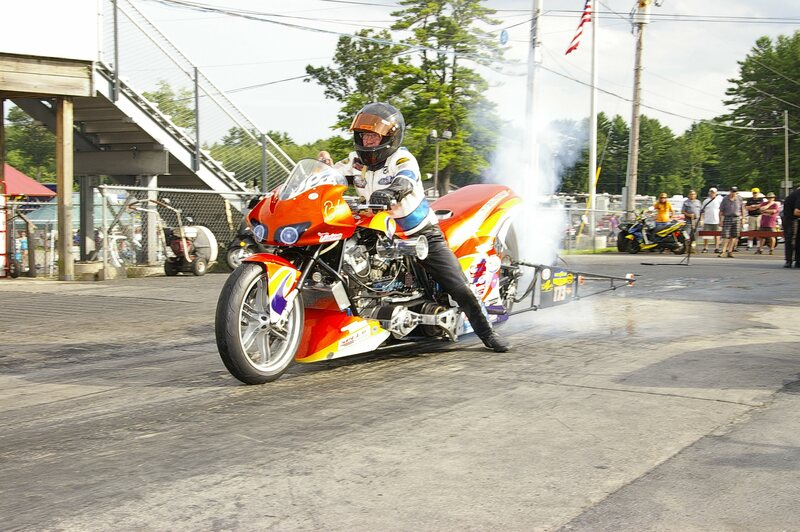 Mike Romine of Sturgis, Michigan builds and prepares the Top Fuel motorcycles for Doug Horne’s racing efforts. Tom McCarthy Photo. was just not enough to catch the Mike Romine tuned machine of Doug Horne. 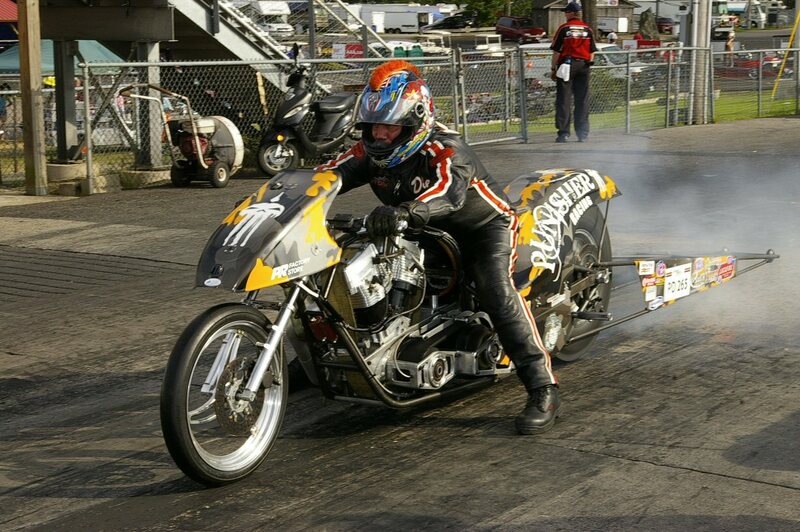 Doug Horne of Aberdeene, Md, defeated Tommy Grimes in the final round of Top Fuel Harley. Tom McCarthy Photo. elapsed time, his best of the weekend, but it was not enough to hold off the man from Japan. As round two of racing in T/F bike unfolded, due to the six bikes entered in the race, an unbalanced ladder resulted, giving Tak a bye run into the final round. 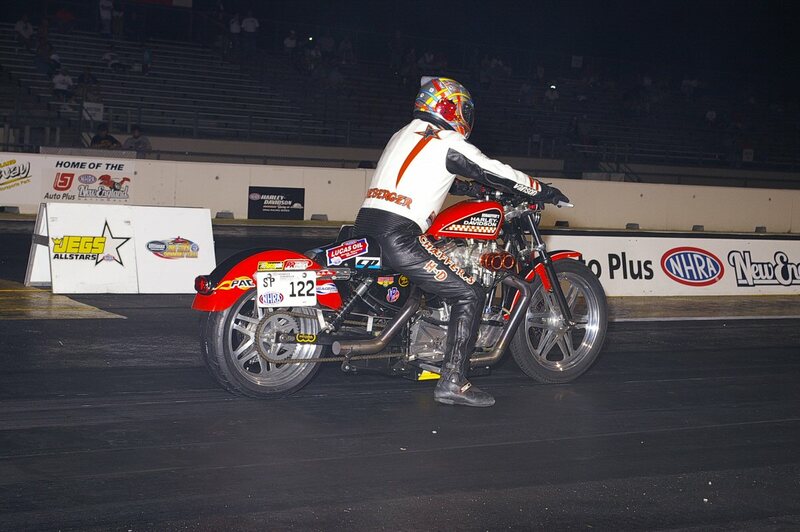 The semi-final round real duel was between Doug Horne and Tommy Grimes of Ray Price Harley Davidson. Tommy posted a .041 reaction time, that was bettered by Horne’s .039-RT. As the bikes left the line, Horne just pulled away from Tommy, who just could not out run the Mike Romine prepared machine. Doug held the throttle to the stops and the bike responded with an awesome 6.23 elapsed time that held as the quickest pass of the event in Top Fuel bike. Mike chose to advance the ignition seven degrees before the pass and adjusted the rest of the settings to compensate for additional power and his combination held. This set the stage for the final round of the day in Top Fuel. 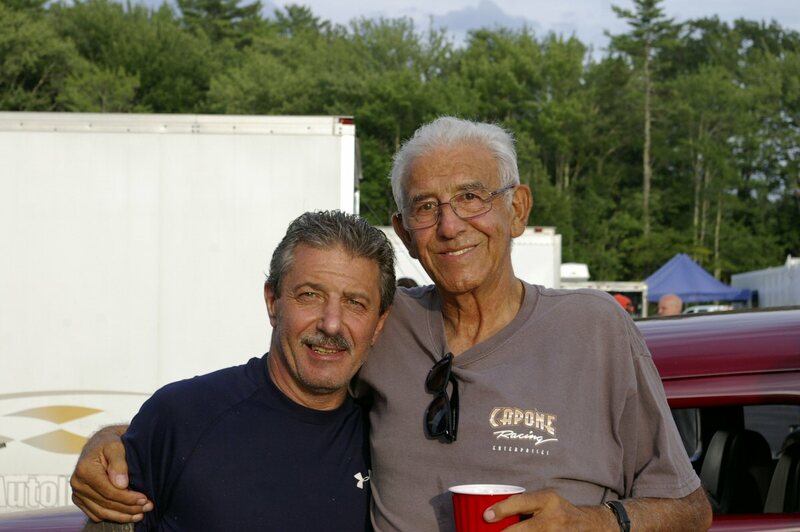 Larry “Drums” Brancaccio, of Nutly, NJ, takes a moment for a photo with a fan; Mr. Frank Capone Sr. of Massachusetts, who ventured north to the Granite State for some nitro Harley action. Tom McCarthy Photo. When Tak lined up against Horne in the finals, his bike was set on KILL by his crew chief Don Johnson of NJ. As the bikes left the line, shortly after the launch, Tak’s bike spun the tire and that was it for Horne, who just pulled away. After the race, Doug commented, “So far this season, we’ve entered six races, we’ve got four wins, we’ve been to five final rounds and we’ve logged four number one qualifiers. I am with an AWESOME race team.” The Horne Concrete sponsored bike is prepared by Mike Romine of Sturgis, Michigan, who not only built the bike, but tunes it for Doug Horne. This win put Doug slightly ahead of Tommy Grimes in points with seven races completed in a ten race series. In other action, Dale Niles, of Purlear, N.C took on Rich Vreeland of Bloomsburg, Pa to settle up the Pro Dragster class. Dale and Rich were the only racers entered in P/D, a class that worked hard to get Harley Davidson’s attention to be included into the HD-DRS. Dale was the number one qualifier and he took out Vreeland by posting a 7.37 elapsed time to Rich’s 7.56. 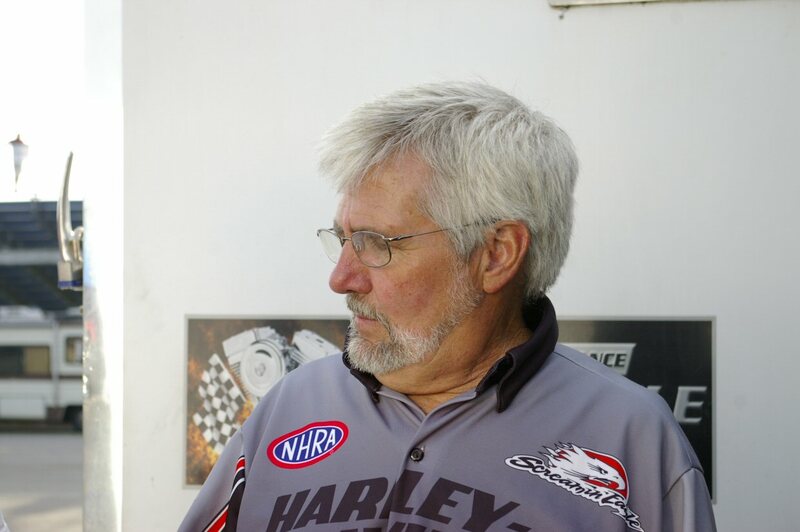 Craig Tharpe, former head of the AHDRA was on hand to help guide the racing efforts of the Harley Davidson racers within the NHRA Lucas Oil Divisional race. Tom McCarthy Photo. In another class that only had two bikes entered, Pro Gas, Sam Hurwitz of Newton Mass, defeated Frank Capone of Wakefield, MA in their only round of racing. As the bikes left the line, Capone suffered a transmission failure and Sam motored on for the win. As fate would have it, Frank knew he would have the only bike entered in the class for this race, so he offered his second bike to Sam so he’d have someone to race against on race day. In effect, Frank hired his own assassin for this race. Sam ran a fine 8.744 in the final round and interestingly enough, he ran an 8.747 on his final qualifying round run. In Street Pro, Bruce Croneberger III, of Cressona, PA, went 8.844 @ 150.1mph to defeat Nick Gonats of Youngstown, Ohio who ran a game 8.994 @ 150.1. There were only three bikes entered in Street Pro, Mike Motto of Jacksonville, N.C. also gave his best effort to the class. Don Johnson more widely known as “DJ” or Nitro Santa for his signature white beard kept busy between rounds preparing the Top Fuel bike driven at this race by Tak Shigamatsu. Tom McCarthy Photo.only entry to the class. His 1992 Sportster had a best of 9.862 seconds at 134mph. Fan attendance, like the Harley drag bikes at this race were less than what the race operators had hopped for. While sudden rising gasoline prices hindered travel for some racers and fans, the extreme heat also worked against race promoters who sought to put fans in the stands: there were less than one-thousand spectators noted in attendance on Saturday for the Harley Davidson Drag Racing Series eliminations. Few people, if any, are willing to sit in 100 degree heat, with high humidity, to watch any sport. 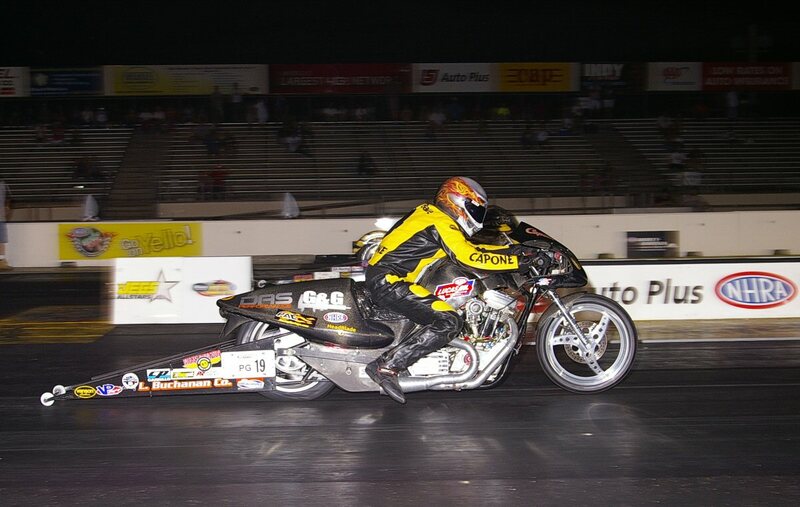 Chris Streeter, of Cleveland, Ohio, gave his best efforts in Top Fuel Harley racing. Tom McCarthy Photo. Frank Capone of Wakefield, Mass suffered a transmission failure in the final round of Pro Gas racing. In Street Pro, Bruce Croneberger III, of Cressona, PA, went 8.844 @ 150.1mph to defeat Nick Gonats of Youngstown, Ohio. 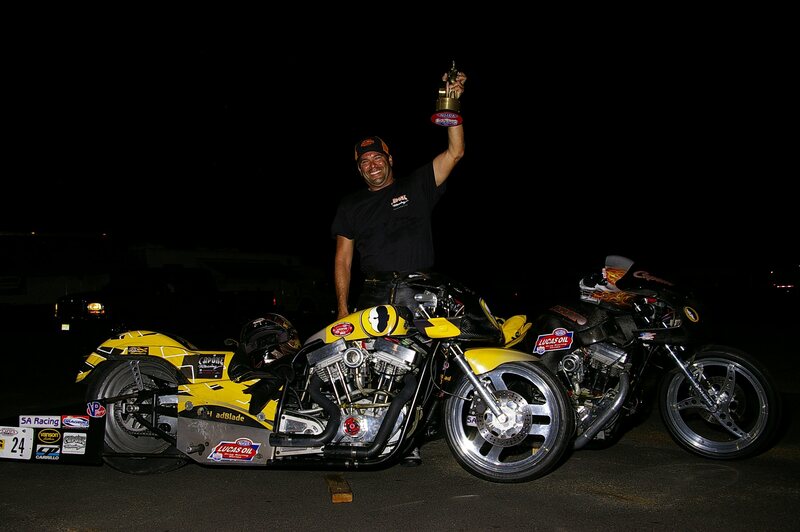 Bruce won with two bikes in two separate classes at the NHRA, Divisional race in New Hampshire, July 20th, 2013. Tom McCarthy Photo. Sam Hurwitz, of Newton Mass, won his first “Wally” at the NHRA Lucas Oil Divisional race while driving a Pro Gas bike for Frank Capone Racing. Tom McCarthy Photo. Bobby Malloy of Elkton, MD, recorded the fastest pass ever by a high-gear only Harley Top Fuel bike during his round one defeat at the hands of Tommy Grimes. Bob’s bike stopped the clocks with a 232.03mph blast. Tom McCarthy Photo. 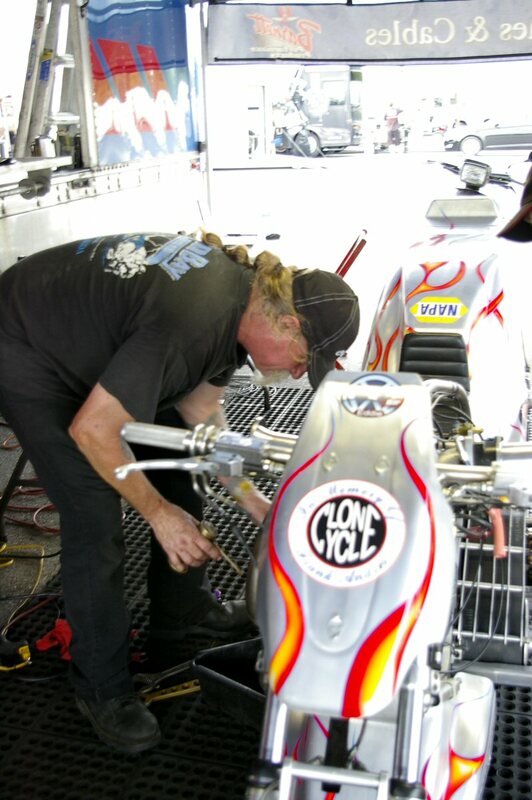 Veteran Top Fuel bike ace Bob Spina was in New Hampshire for the race helping out in several Top Fuel bike pit areas. Tom McCarthy Photo. Dale Niles, of Purlear, N.C won the final and only paring in Pro Dragster racing against Vreeland of Bloomsburg, Pa. Tom McCarthy Photo. Know something, that the NHRA created and supports this series is a given. Been several HD only series in the past. Why can’t someone meld all of the different brands together under one roof..?? Tom Loughlin did it with DragBike. The only reason NHRA PSB became a reality it because of terry vance, and all of us who ran around race to race loosing to him, yet kept coming. Now look @ thing they way they are. Want spectators, give them something too watch!